I love the summer so much. I spend the entire winter counting the days until it gets warmer and the mornings get lighter. But I’m beginning to think that when it gets really warm my running suffers. Case in point – The North Downs Way Marathon. Hermes Running North Downs Way Marathon starts from near Reigate Hill Car Park and heads West out to Box Hill, Surrey. In previous editions, the course had continued on for 13.1 miles before turning and heading back. For 2017 the turn point was at the summit of Box Hill at just over 10km, making it a two lap course. Richard and I parked at Reigate Hill Car Park which has beautiful views over Surrey. We noticed a lot of runners parking at the railway station at the bottom of the hill and having to walk quite a way up the hill to registration. I guess there’s only so much room at the top of the hill and perhaps people thought the car park where we were would already be full. Suffice to say, for us it was just a short stroll across a bridge and up the hill to the start. It was already warm and sunny as Dave Ross started his race briefing, and it wasn’t going to get any cooler. It was good to see both Cat Simpson and Paul Sargent toeing the line and looking for the win. As always when I am filming, I don’t worry an awful lot about how fast I run or in what time I finish. However, I still try. I still want at a fairly decent time. I will almost always prioritise getting a good camera shot for time but my average pace is still there in the back of my mind. Richard took off at the hooter, as did Paul Sargent. I accepted this as normal and carried on in my usual vein. The route is……well it’s not flat that’s for sure. There’s a gentle up at the start, then a gentle down before a massive, long, really steep down. All thoughts at this point were, “we’ve got to climb up this on the way back…..and then do it again later!” It’s the steepest hill in the race but by no means the only one. There are plenty more ups and downs en route to Box Hill including some steps, which are always fun. For some reason, I just couldn’t get going. My marathon times haven’t been great really this year for a variety of reasons. My best time is 3:19 so far at Paris. London was 5 hours because I was filming. Dorchester was 4:41 because I was filming and running with my wife in her first marathon. My best trail time is 3:58 at Steyning Stinger Marathon. That’s got a decent amount of elevation so I’m fairly pleased with that. Anyway back to the NDW marathon. There’s a checkpoint at 6km which is under the welcome cover of trees. Then a pretty busy road crossing. On this occasion we had the famous Nuala Smyth manning the crossing for us. This is followed by a tiny section of pavement running before the climb up to the turn point. The climbs are always worth it though for the views. The two aid stations were manned by volunteers from a local army Cadet Corp. I’m sure they thought I was a bit of a freak with my camera the looks I was getting as I talked into it whilst throwing water over my head! I was so hot and I’d really like to use the heat as an excuse for my laboured running. Richard was miles ahead of me even at one quarter of the way in. A nice thing about lapped or looped courses is being able to see the leaders and other runners as they pass. Hermes Running also organise a half marathon on the same day so it was good to see them on the course too. The climb up the really steep hill was an absolute killer and I seriously couldn’t imagine having to do it again after 13 more miles! At half way, I stopped briefly to chat to Cat Simpson who had been in the lead but had called it a day. She was still recovering from her epic run in the 145 mile GUCR. So her legs were understandably a little heavy. I took my hydration vest off for the second half. I had only worn it to carry some audio recording equipment. It was only after the start that I realised I’d forgotten to put the SD card in so couldn’t use it. I was relying on the aid stations for water, which is normally fine over marathon distance. Paul Sargent passed me on his way back on the second loop before I had even reached the 6km aid station on the way out. I was really melting and if there hadn’t been so much tree cover I fear I may have been even slower! It was good to meet James Bennett on one of the climbs and to run with him for a while. 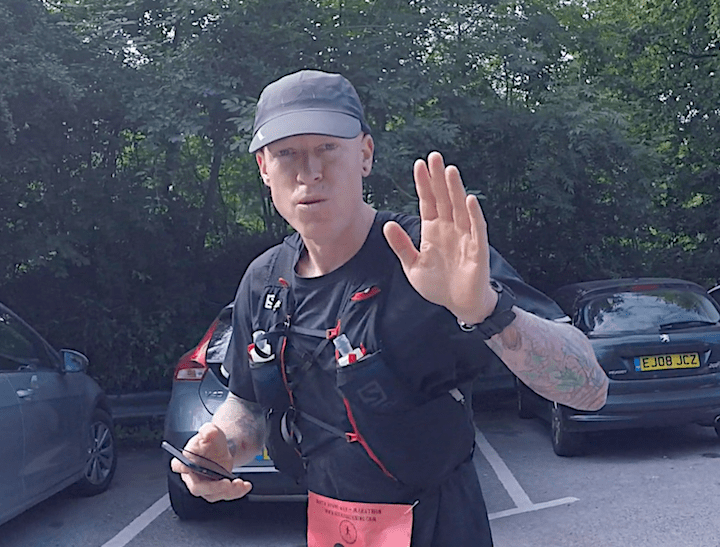 You may remember I filmed him running his 98th marathon in Paris in 2016. The North Downs Way Marathon was his 195th! By the time I reached Box Hill for the second time there were a lot more people enjoying the view in the sunshine, sitting on their tartan rugs with a picnic. It was all I could do to drag myself away for the final 10km push home. As a brief aside, you may know that I am a big fan of Zwift. 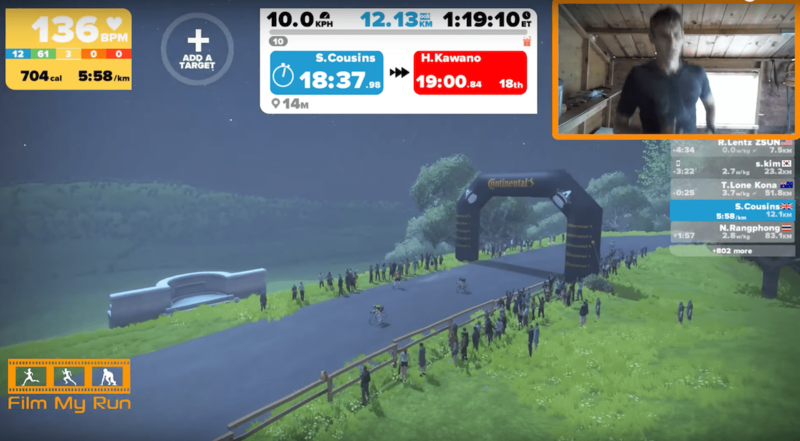 Zwift is an online cycling and now also running tool. You ride or run virtually with other people around the world. One of the courses you can try is a real world representation of London with a sneaky short cut to a virtual climb up Box Hill. So if you live miles away and you have never been, you can still run up to the summit of Box Hill if you would like to. 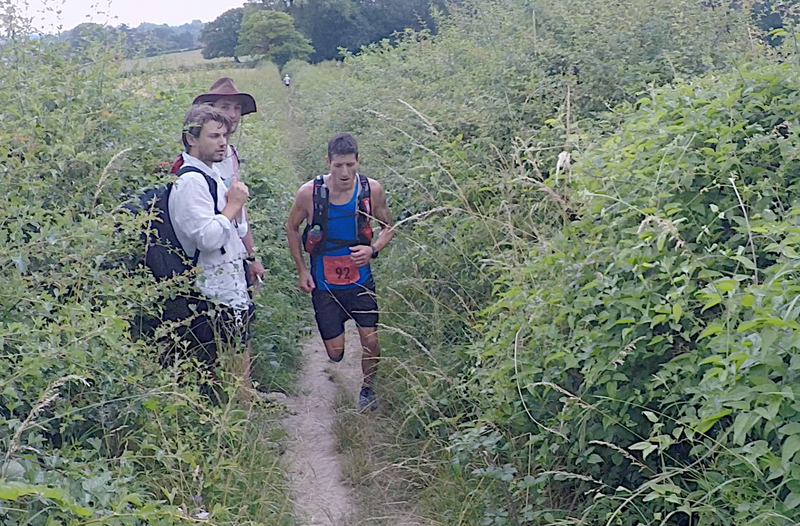 The terrain along this section of the North Downs Way Marathon is not easy running. You need to watch where you’re putting your feet most of the time. The ground can be very rutted and I imagine in the wet it could be a real quagmire. There are also plenty of tree routes through the wooded sections and loose stones on the steps which could easily catch you out if you don’t have your wits about you. I eventually made it over the line in around 5 hours 7 minutes. Overall elevation was not horrendous, something like 1100 metres or 3500ft so I can only blame a lack of fitness, heavy legs from the previous week’s 100km race, the heat and the filming! Is that enough excuses to get me out of what was a pretty slow day at the office? Richard, who did the same 100km race as me last week and experienced the same heat, finished in under 4 hours. I don’t know. Some races you’ve got it and some you don’t. 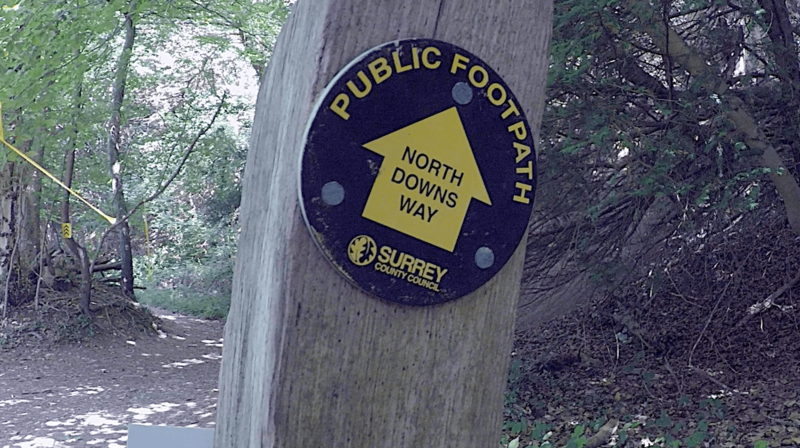 As always, if you have enjoyed reading this North Downs Way Marathon race report, and you like the film I’ve made, please do give it a like and share it with your friends. If you like running videos there are plenty on the site. Just click here or go direct to my YouTube channel. Thanks for reading. Well done Steve , always enjoy your films and commentary . Keep up the good work ,refreshing hearing your views on events .